Cup of Coffee 6/19: It was a perfect day for Red Sox affiliates as all seven teams picked up wins on Saturday. 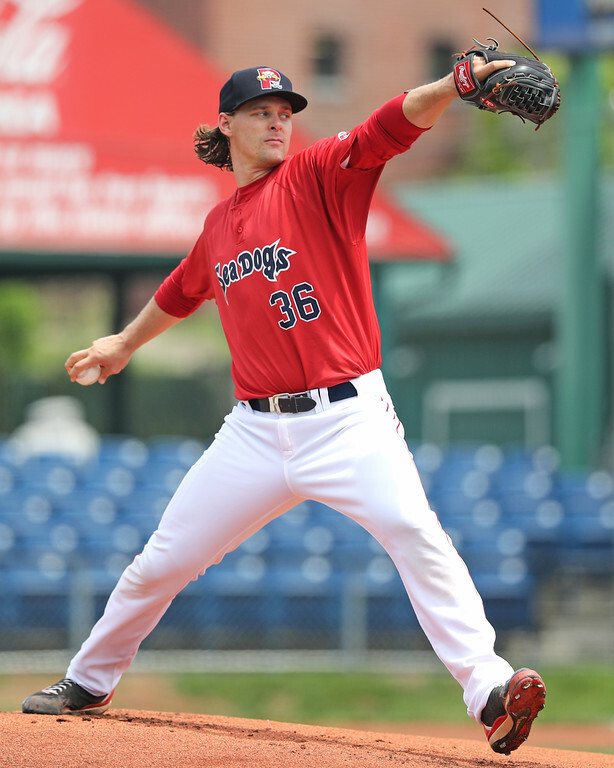 Justin Haley (pictured) made an impression in his first start for the PawSox. Trey Ball made a solid start for Salem and Austin Maddox dominated on the hill for the Sea Dogs. Offensively, Aneury Tavarez turned in a five-hit game for the Sea Dogs while Andrew Benintendi and Josh Ockimey homered in a day full of strong performances by Red Sox prospects. Justin Haley dominated Louisville in his PawSox debut, throwing eight innings and picking up the win. Haley allowed only one run on three hits and a walk while striking out seven. Noe Ramirez picked up the save with a perfect inning of relief, striking out a batter and lowering his ERA to 2.25 this season. The PawSox picked up their first run when Rainel Rosario scored Chris Dominguez with an RBI groundout in the second inning. Their next run came in the sixth inning on a solo shot from Chris Marrero, who is hitting .289/.342/.506 this season. Ali Solis hit a two-run homer in the seventh to give the PawSox a little bit of insurance en route to the victory. Aneury Tavarez led the charge on a big day for the Sea Dogs offense as they recorded 14 hits and scored 10 times. Tavarez went 5 for 5 with two runs and two RBI and finished just a home run short of the cycle. Andrew Benintendi went 2 for 5 with a pair of runs and smacked a two-run homer in the ninth. Nate Freiman and Cole Sturgeon each had two hits and scored a run in the blowout victory. Jake Romanski and Wendell Rijo were the only starters who failed to reach base, though the latter did work a walk. Starting pitcher Austin Maddox threw only four innings for the Sea Dogs but was excellent, allowing no runs on just two hits and a walk while striking out five. Nik Turley picked up the win, despite allowing two runs in two innings and southpaw Luis Ysla allowed a run in 1 2/3 innings of work. Jake Drehoff closed out the game with 1 1/3 scoreless innings, striking out two and walking one. Trey Ball was shaky against the Dash but managed to limit the damage. The left-hander allowed just two runs in seven innings but was working through trouble much of the time, allowing eight hits and four walks while striking out four. Yankory Pimentel threw two dominant innings to finish the game, allowing no runs or hits and striking out three and walking one. The Red Sox picked up an early lead in the top of the first when Mike Meyers grounded out, scoring Mauricio Dubon. However, they would not score again until the eighth, when Joseph Monge walked with the bases loaded to score Jordan Procyshen and then Deiner Lopez came across the plate on a forceout off the bat of Dubon. Salem picked up an insurance run on an RBI double by Procyshen in the ninth. The Drive lineup racked up 15 hits in an offensive barrage against Hagerstown. Greenville pushed across their first runs on a three-run blast by Derek Miller in the fourth and never looked back. Josh Ockimey ripped a solo home run in the fifth and then Greenville picked up two more runs in the seventh and a final run in the eighth. Ockimey was 2 for 5 with a double and his 10th home run and is now slashing .297/.435/.531 this season. Tate Matheny was 3 for 5 with two doubles, a run, and an RBI. Jose Almonte threw five strong innings for the Drive, allowing a run on three hits and a walk. Marc Brakeman threw three brilliant innings of relief, allowing just a hit and a walk while striking out five. He now has a 4.66 ERA and 49/14 K/BB in 48 1/3 innings with Greenville. Austin Glorius struck out a batter in a perfect ninth. The Spinners continued an excellent night by Red Sox affiliates with a slugfest victory over Vermont. Lowell scored one in the second and then three in the third, highlighted by a two-run single by Yoan Aybar. They scored single runs in the fourth and sixth and then piled on a few more in the eighth with a two-run triple off the bat of Tyler Hill, who was 3 for 4, coming as part of a three-run inning. While Josh Pennington gave up three runs in 3 1/3 innings, he did notch seven strikeouts and did not walk a single batter. Daniel Gonzalez followed him with 4 1/3 frames of relief, giving up two runs on four hits and a walk, striking out three. Gerson Bautista picked up his first save of the season with 1 1/3 shutout innings, striking out two. Rayniel Adames took the hill on Saturday and turned in a phenomenal performance, tossing five innings and allowing just one run on four hits while walking none and striking out four. Angel Padron threw three shutout innings of relief and then William Caraballo, who allowed two runs and failed to record an out, and Juan Florentino (one inning, no runs, no hits, one strikeout) combined to close out the game. Catcher Eddy Reynoso was the offensive star, going 3 for 4 with two runs, an RBI, and a double. Jose Zacarias threw four shutout innings for the Red Sox, striking out three and allowing just two hits and no walks. The Rangers' scored just one unearned run off of Warlyn Guzman, as both Guzman and Luis Rivero combined for four innings of one-run ball. Joan Martinez tossed a shutout frame to end the game. First baseman Pedro Castellanos was 2 for 4 with two RBI, and Eduard Conde, Keibert Petit, and Antonio Pineiro each had 2-for-4 games as well. Player of the Night: Justin Haley had performed well at every stop in the minors until he reached Portland last season and posted a 5.15 ERA. However, he has come back stronger than ever in 2016, pitching to a 2.20 ERA and earning a promotion to Pawtucket. He was exceptional in his first start with the PawSox, tossing eight innings and allowing just a run on three hits while fanning seven.